Details about PRICKLY PEAR CACTUS IN BLOOM! HOT PINK FLOWERS ON ALL SPECIMENS! PRICKLY PEAR CACTUS IN BLOOM! HOT PINK FLOWERS ON ALL SPECIMENS! Winter Hardy Opuntia Prickly Pear Cactus Ruffled Pink Orange Colored Blossom!!! Hardy Prickly Pear Opuntia Cactus, Large Pinkish Red Cream Colored Flower's!!! 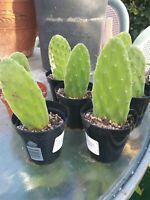 Winter Hardy Opuntia Prickly Pear Cactus Large Ruffled Salmon Colored Blossom's!